Beatman & Ludmilla bring you over 1.1 GB of exclusive content, with full-on Breakbeats, gut-busting Basslines, euphoric synth arpeggios, evolving pads and cinematic FX. Over 200 Loops are included, in addition to 313 One-Shot samples; ready to sequence and trigger in your DAW. Expect a vast range of Electronic influences here with bit-crushed basslines and Acid sequences accompanied by the natural sounds of string, guitars and pianos, to deliver a hybrid fusion like no other. You'll find the beats come hard and the bass comes heavy, with expert production in hardware and software form showcased throughout the pack. They've included 12 multi-sampled Instruments, 228 REX2 loops, MIDI files and 74 sampler patches that allow you to play and cut up the sounds easily in your favourite DAW, providing Electronic inspiration for many seasons to come. 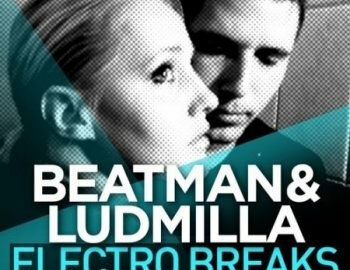 At tempos from 110-152, 'Beatman & Ludmilla: Electro Breaks' is ideal for Electro, Breaks, EDM, House, Techno and Electronica. As always all musical content is key labelled for instant integration in your music. Let Beatman and Ludmilla take you on a journey of Electronic exploration, with this superb fusion of Electronic beats and sounds. Download the free taster pack and check out the demo to hear more.